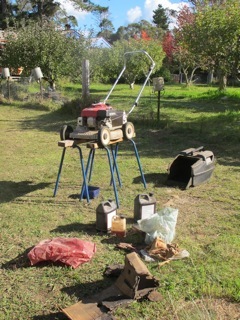 The Lovely and I have been doing a bit of community service down at the Moss Vale Community garden. It was a joint meeting of the seedsavers, Permaculture and community gardeners groups. We went along to hear David Murray talk to us about preserving older ‘heritage’ varieties of peas and beans. He’s an ex-academic from Wollongong who’s specialty is peas and beans. I don’t want to pea in his pocket, but he was good! He really knows his stuff and now we know more than we probably need to about peas, beans, their propagation and the safe storage of the seeds. 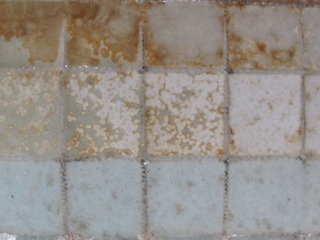 He has quite a complicated rigmarole of drying and desiccation using repeated applications of silica gel. Followed by a few days in the freezer to kill weevils and then double storage in glass jars with more silica gel in the intermediate space. Very thorough! After the talk we spent a couple of hours fettling, sorting, winnowing and sieving various seeds for the community seed bank. We took along a big bag of our own vegetable seeds that we had saved and packeted for our own use in recycled envelopes, but as always, we live with abundance, so we have far too many seeds left over, more than we need, and as we collect more seeds every year, we end up with such a lot that we have to throw the older ones out eventually to make room for this seasons fresh seeds. We’re not very thorough about it. We just let one of the biggest and healthiest plants grow on to seed after all the other plants in that bed have been harvested. 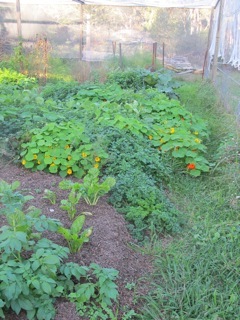 I prefer a plant that is close to the end of the row so that it is more or less out of the way. In this way, I can reuse the bed without disturbing the roots of the seeding plant. These selected plants often grow into small trees and need to be staked to keep them upright. 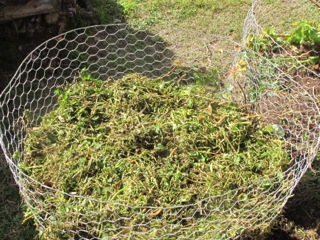 One plant like this can carry enough seed for the whole village. We only collect a small selection for our own use. There is always a lot that blows away and spreads all over the garden, the paths and the lawn. We put the seeds into big paper bags along with some of the stems that they are attached to and place them in the linen cupboard in the laundry that has the hot water tank in it. 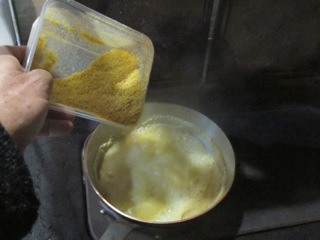 The gentle warmth in there dries them out nicely over a few weeks or a month or so. This seems to have eliminated the need for the silica gel for us. On this occasion, we donated coriander seeds to the seed bank and came home with some extra tall growing ‘skyscraper’ climbing peas. We haven’t grown these before, they are new to me. Apparently they can grow up to 3 metres tall! We’ll see what happens. I hope that they don’t as my trellis isn’t high enough. Growing this tall doesn’t sound like an advantage to me. The plant must put a lot of energy into making such a tall frame and then it might be vulnerable to strong winds? However, we are promised that they are very tasty to eat. The seeds that we get are a couple of years old now and need to be ‘refreshed’ for the bank. So this will be our contribution back to the seed bank later in the year. We have tended to be pretty slack about our labelling up to this point. We have so much to get done each day that somethings don’t get done very well. As it turns out labelling the exact variety of seeds tends to be one of the things that we don’t always record. We just write something like “climbing peas 2014,” or ‘bush peas 2014’. This is enough information for us, but doesn’t make them very useful to a seed bank. The plants seem to grow well enough for us, we just don’t always know which variety that it is exactly and we haven’t needed to care about it either. From now on we will try and be a little bit more attentive to detail, so that our efforts won’t be wasted and our seeds can be useful to others through the seed bank. 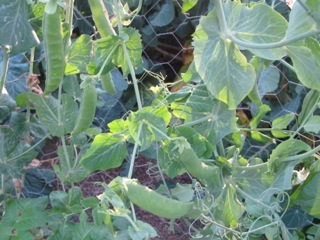 I can’t help eating a few peas every time I go to the garden at this time of year. I can’t walk past them. 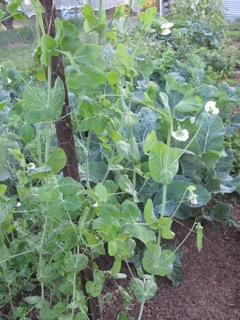 They have to be one of the most delicious vegetables that can be eaten raw directly in the garden. They are such a sweet treat. In the Oxford Book of Food Plants, I read that there is a variety called ‘Harrison’s Glory,’ now that is the variety that I ought to be growing! But alas, I haven’t seen it anywhere as yet. It could be one of those older varieties that has slipped from general usage over time and probably only exists in a seed bank now? On the other hand, there is a variety called ‘Balmoral,’ listed in the CSIRO book, ‘The small food Garden,’ I certainly should be growing that variety here. But again, I haven’t seen it anywhere around as yet. 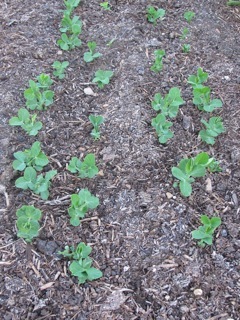 The follow-on crop of peas is just emerging. I’m determined to give peas a chance. We also grow coriander on and off all through the year, just like everyone else does I suppose? I don’t know how many varieties of coriander there might be, but I can only surmise that there might be quite a few, especially in Asia. I don’t know which one we grow. We just grow our own ‘generic’ coriander and always have recycled our seed in this way. 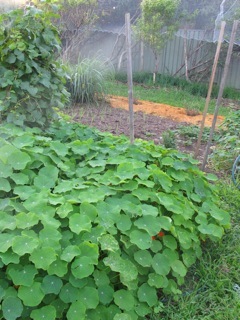 It’s a very prolific seeder. Some years ago I bought some ‘cilantro’ coriander, that was supposed to be slow to bolt to seed and be more leafy, but it grew just the same as our ordinary variety, so I didn’t save any seed from it. 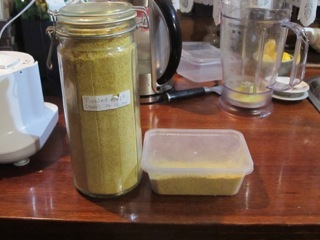 We added our multi-generational ‘generic’ coriander to the seed bank as well. gets it all shredded pretty fast. 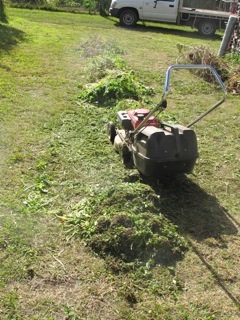 Once it has all been mown over a few times, it’s reduced to damp mush in the catcher, it then mixes really well with the dry material and a bit of chook poo to make very fast rotting compost. We fill the bin to the top in layers and it gets hot in hours, in a few weeks it’s rotted down to half way. We have 3 sites around the garden and orchards where we have these wire rings located. 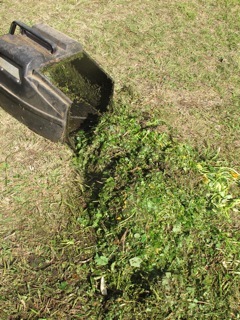 They are constantly being filled, rotted and emptied, every few weeks, as we need the compost for planting out. Shredding and mulching like this breaks down the plant fibre structures and they compost so much faster than if they are just all piled up without shredding. 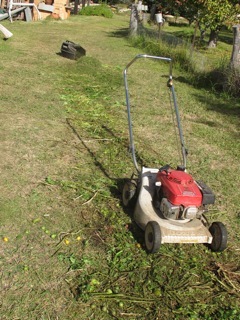 This Honda Buffalo mower has given us terrific service for the past 25 years. 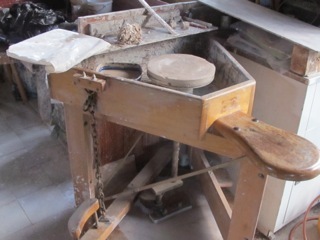 It’s always easy to start and works hard all day, when it is used. I change the air cleaner and oil once each year, a spark plug each decade and new blades as required. It was a good quality brand and quite expensive in 1989 when we bought it. But it was a good investment and has paid off. This is one of the few things that we own that hasn’t needed to be re-built at some stage during its life. It just keeps on working. 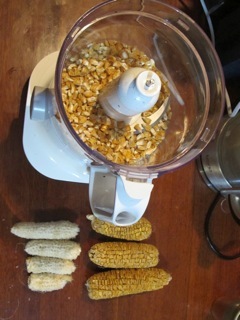 The last few cobs that were left on the corn plants were 2nd cobs. These are usually a lot smaller than the first cob. 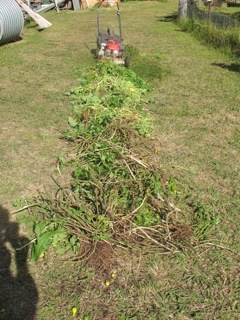 We left them on and allowed them to dry off, then collected them before we shredded the stalks. 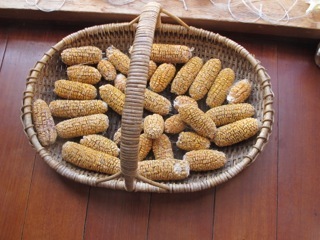 I finished drying the cobs in the sun in front of the kitchen window. After a few weeks they appear to be quite dry and shrivelled. 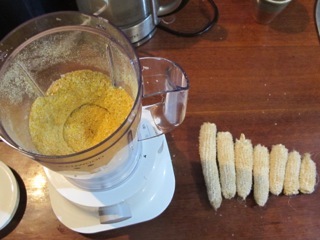 I decide to put the kernels through the blender and make some corn meal for polenta. 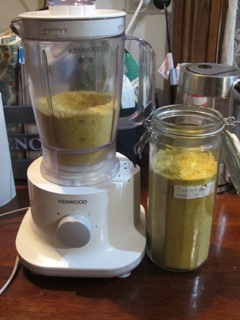 I end up with two very nice meals of ragu and polenta, plus a bit more than a large jar full of corn meal for more warming meals over the coming winter. 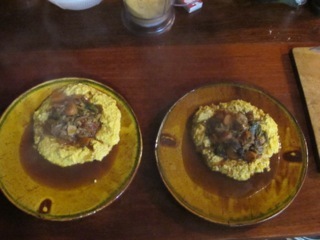 Two cups of water to one cup of polenta, seems to work quite well and makes enough polenta for the two of us. It’s a bit dull and dry by itself. It needs some sort of sauce to lubricate it. I’ve tried it a few different ways and I like it better with a little cheese added in. One more thing that we have done recently with the stripped out garden plants before mulching them all into compost, was to pick all the seeds from the nasturtium plants to make fake capers. After washing them well, I soaked them in salt water for a day, and after rinsing them well. I poured lightly salted pickling vinegar over them. 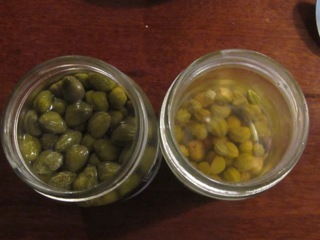 They taste different from capers, but they are a very good substitute and it’s good to be able to use every part of the plant. Nothing wasted. 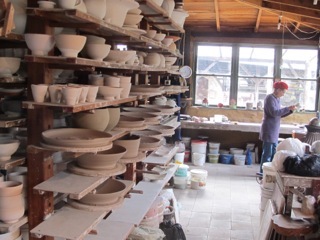 Back in the pottery we’ve both been making plates. 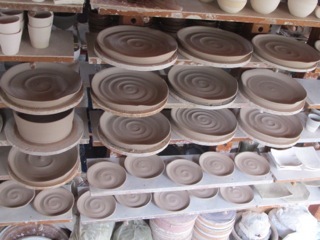 The lovely is making slab dishes and I am throwing plates on the kick wheel. 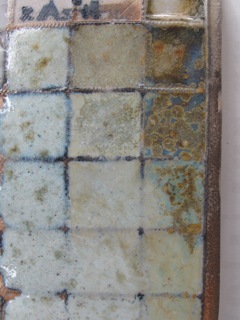 I have a few very nice glaze tests coming along using wood ashes and ball-milled granite. They look good but need a flat surface because they are very fluid. 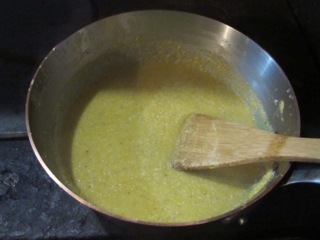 When I stiffen them up to eliminate the running, they aren’t the same glaze any more. 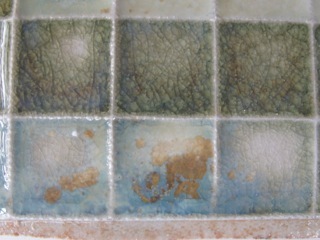 The best looking glaze tests need to be very fluid to get the most attractive result. So that is why I’ve decided to make plates just now.Plates with a slight turn up at the edge, to allow for the very fluid glaze to pool without running off. 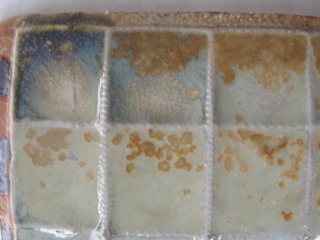 Janine has wood fired raku workshops booked for the next 3 weekends so she is busy making pieces for demonstrating during those workshops. from the seed savers and wannabe self-reliant post modern peasants. With love from Steve and Janine who are getting along together like two peas in a pod.